March caught us up in a whirlwind of peace-building opportunities beginning with our “2 Faiths 1 Friendship” Mixer on the 6th, followed by a talk at an evangelical Christian school a few days after that, and capped off by our fifth Training 101 course last Saturday. 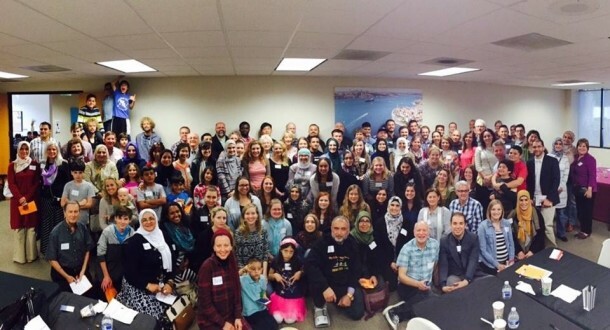 About 150 Muslim and Christian friends attended the Friendship Mixer — our fourth so far — to celebrate the one-year anniversary of launching the peace-building initiative. The afternoon flew by as kids, youth, and adults connected over delicious food and important discussions. 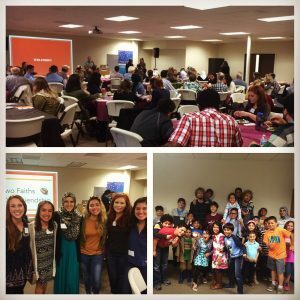 After a brief welcome by organizers and a video with congratulatory remarks from prominent Muslim and Christian leaders that have been our mentors, each age group split off to explore the barriers between Muslims and Christians, what the two have in common, and, finally, ideas on how to bridge the communities. The best part of the event took place toward the end when all the participants came together for a group picture for the first time since we started hosting Mixers last February. Attendees shared the group picture all over social media to show the world how Muslims and Christians were working together to benefit all! For more stories and pictures, please check out our Facebook Album of this event. A few days later, we had the privilege of speaking in front of a 300+ crowd at an (Evangelical) Christian university about our peace-building work between Muslims and Christians. We were humbled by the warmth of our hosts and the support of our friends, some of whom drove from San Diego and north LA to attend! Finally, this past Saturday, about 25 Muslims and Christians gathered early in the morning to attend an intensive, 3-hour training 101 session, where we delved deeper into theological questions and some of the “yes, but…” issues between our communities. The Training 101 course is meant for those who attended a Friendship Mixer and feel ready taking the next step in the journey. Our training group spent the morning learning about each other’s beliefs and breaking down the assumptions about the two faiths. The course brought us all one step closer in understanding each other so that we can strengthen our friendships and work together. If you are interested in starting your journey in Muslim-Christian peace-building, make sure to attend our next Mixer on April 17 in the Pasadena/LA area! There, we will be announcing details about the next training 101 opportunities as well. We hope to see you there!